After nearly three weeks travelling around Sri Lanka, we finally arrived in Galle, with only two days of our trip left. 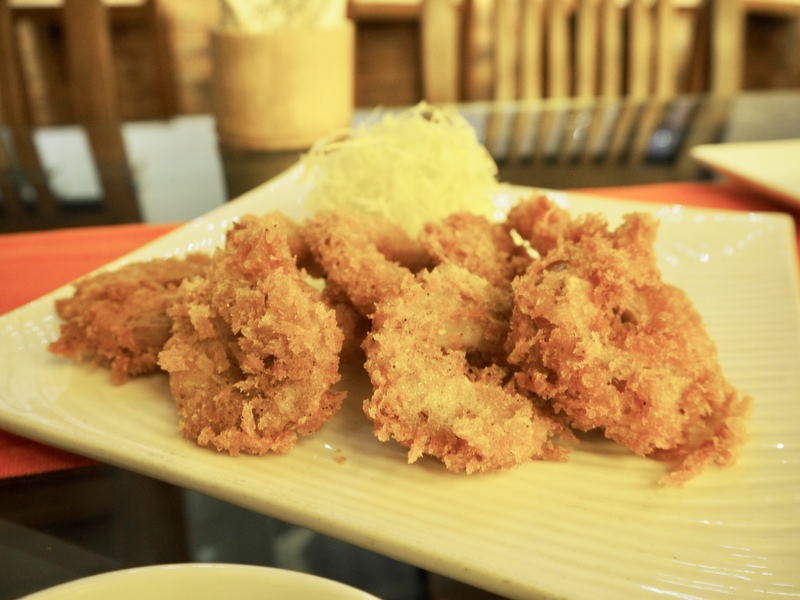 We’d been humming and hawing about whether or not to visit this colonial city a couple hours south of Colombo, but once we found out that another one of Dharshan Munidasa’s restaurants (The Tuna and the Crab) was there, we stopped hesitating and planned it in. We arrived from Mirissa that morning, after a bus ride that had been nothing short of traumatic. All of our bus rides in Sri Lanka had been sweaty and uncomfortable, but this time we were physically squeezed in between what felt like a thousand people, with temperatures well above 40 degrees, shoved around with absolutely no respect for privacy, sweat streaming down our faces, all whilst being blasted with the dust and pollution from outside. So when we arrived at our guesthouse in Unawatuna (what a wonderful phrase…), we had a short period of recovery that consisted of scrubbing ourselves clean and having some fresh juice at a little cafe nearby. Relieved, we then made our way to Galle in a tuk tuk (there was just no way we were getting on another bus!). We spent a lovely afternoon walking around Galle, which is a small, colonial style town with beautiful views of the coast. The heat was nearly unbearable, but we still did the full walk around the city walls, which allowed for some excellent people watching and plenty of photo opportunities. We then had to take a break from the sun, and spent a good while sitting in cafes drinking ice-cold drinks before heading back out to catch the sunset. The clouds slightly defeated us, but it was still a beautiful sight, and then we headed over to the real reason we’d come. Tuna. And Crab. At The Tuna and The Crab. As we entered, the soothing jazz music calmed us down, and the worries of the morning’s bus ride melted away. 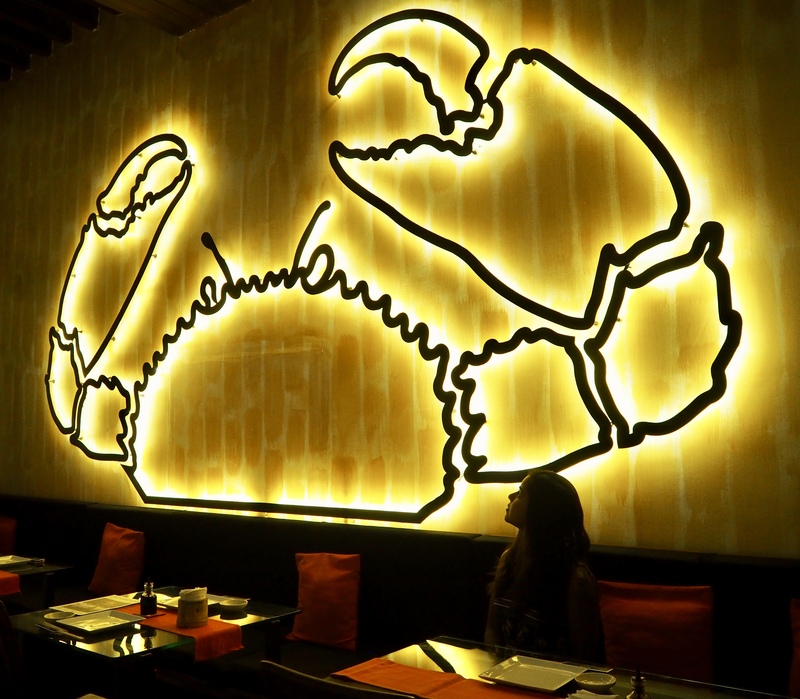 The decor, much like at Ministry of Crab, is elegant and chic, and the restaurant’s name is allegorised through the light fixtures on the wall, which we were immediately taken with. It also featured the same parrot beak / crab claw plants we loved! We were fortunate enough to visit both Ministry of Crab and Nihonbashi (post to follow) on our trip, and The Tuna and The Crab’s menu features a mix of the two, in addition to its own signature dishes. We decided to focus on the latter, but still struggled to decide as everything sounded so delicious! Luckily, the restaurant manager offered to bring us his recommendations, meaning all we had to do was sit back and enjoy. We took in the restaurant’s red-and-white colour scheme and admired the wooden beams and chairs as we sipped on thirst-quenching chilled coconut water – a welcome relief after the heat of the day. 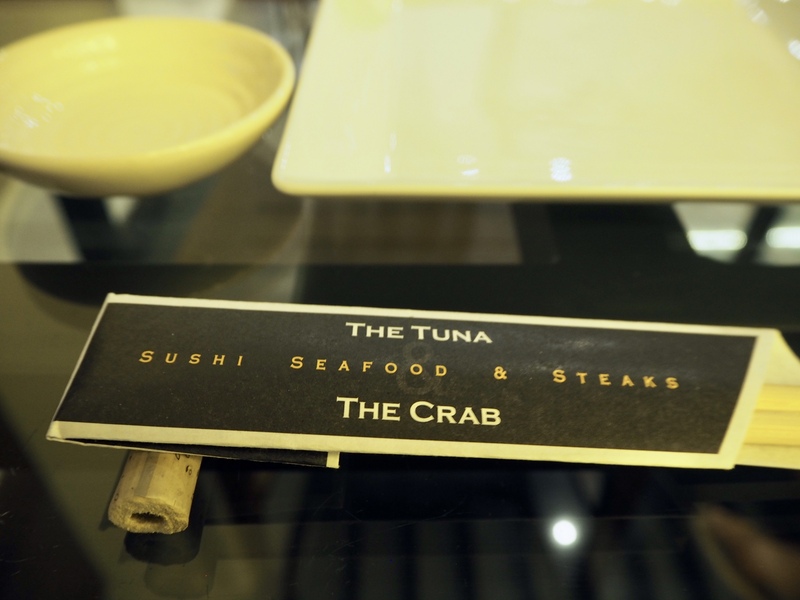 Interestingly, The Tuna and The Crab does not hold an alcohol licence, but it allows guests to bring their own drinks with no corkage fee, and indeed one of the design features is a beautiful cabinet filled with all the appropriate glassware for alcohol. 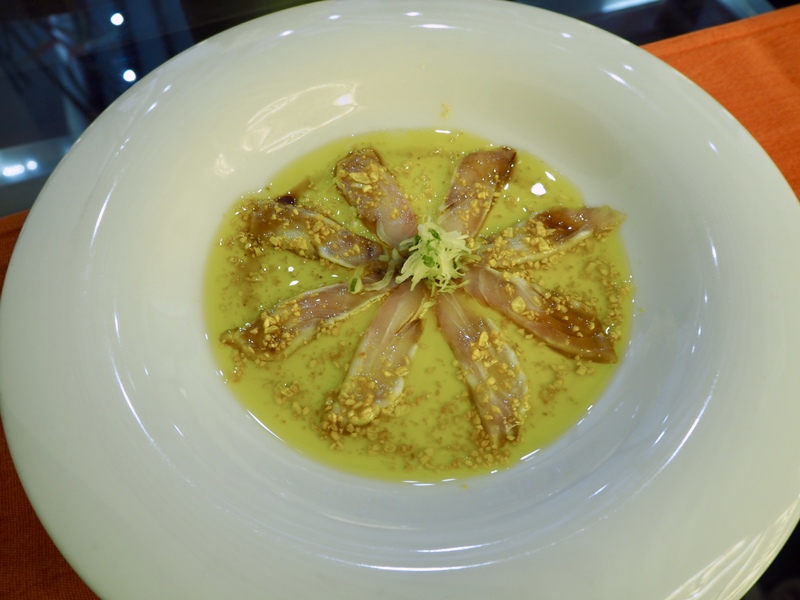 We started off with the restaurant’s specialty: sea bream sashimi with olive oil, garlic, soy sauce and spring onion. It arrived in a perfect arrangement, and then the sizzling sauce was drizzled on top with a theatrical flair, exuding the mouth-watering aroma of garlic, with the hot oil slightly cooking the fish as it hit the plate. To me, this dish was perfect. The fish was soft and fresh, thinly sliced, and collapsed on my tongue. The garlic was crunchy and fragrant. The olive oil was clearly of superbly high quality. And just as my companion remarked we’d need a spoon for the excess sauce, we were brought some bread to soak it up. This dish is beautifully simple, and relies entirely on ingredient quality (and not burning the garlic). I wanted at least three more plates of it! Next up was a dish the restaurant is very proud of, which is the avocado and crab salad. 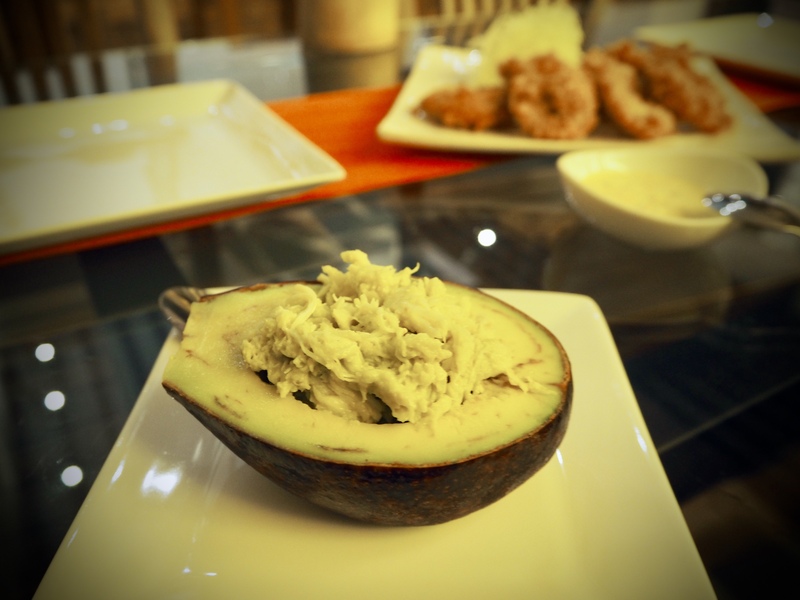 It is incredibly un-photogenic due to the monotony of colours, but the combination of insanely fresh crab and perfectly ripe avocado is simultaneously creamy and fiery, as the crab is tossed in wasabi. Perhaps a little heavy, as you’re eating half a large avocado, but the flavour combinations were absolutely wonderful. I could happily have just this for lunch every day. We were then slightly confused by the next dish, which was onion rings. Sure, they were crispy and fresh, sweet due to the use of red onion, and served with a lovely homemade tartare sauce. But they just didn’t match the rest of the food, which was Japanese with some Sri Lankan flavours thrown in, and so they felt unnecessary. 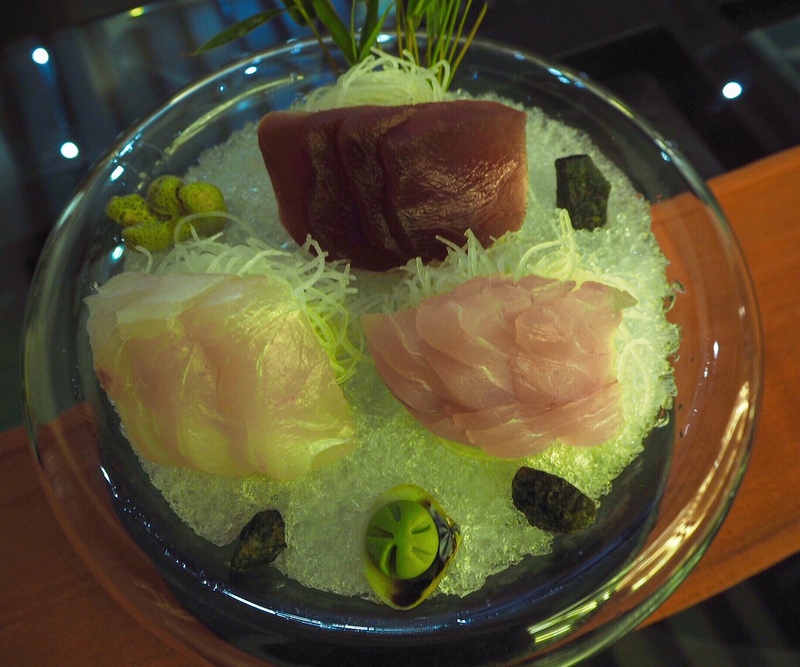 Next up: a sashimi trio. Presented creatively in an upside-down fishbowl, the exquisite and velvety tuna hailed from Colombo, whilst the red mullet and sea bream were straight from the south coast. The latter two, though fresh, unfortunately felt a bit sinewy. Due to some excellent sashimi I’ve had in London (I’m thinking about Sushisamba in particular), I wasn’t completely convinced overall, but the namesake tuna definitely delivered. After the sashimi, we were presented with a crispy prawn hand-roll, stuffed with tempura prawn, wasabi mayo, sticky rice, and soy sauce. We were told to eat it absolutely immediately, so there’s no photo of this one! I enjoyed it – overall though, it wasn’t anything too special, especially if you’ve had hand rolls before. But to make up for the slightly underwhelming hand roll, the next dish absolutely blew us away. 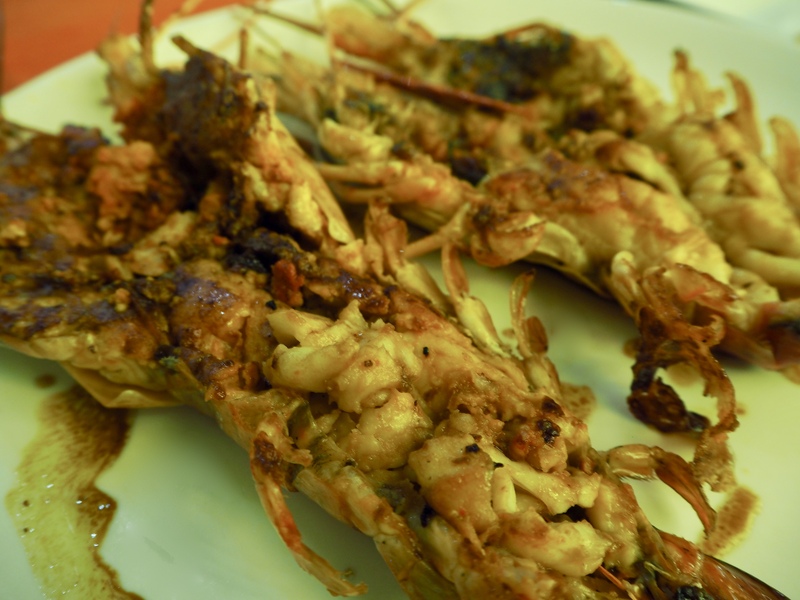 It was freshwater prawn with olive oil, garlic and soy sauce. Again, something very simple. But much like the sea bream sashimi, the simplicity is what tipped it over the edge. First off, the prawns were huge. This meant we could properly taste the difference between the various types of meat within just the one crustacean – something I’ve not experienced with prawn before. The tail, the middle, and the head all had different flavours and textures, and it was cooked so perfectly that the meat basically fell out of the shell as soon as I prodded it. Supremely soft, not chewy in any way, it absorbed the garlic and soy flavours, yet tasted incredibly fresh. My companion claimed that her salivary glands and taste buds were on overdrive for this dish, and she was absolutely right. 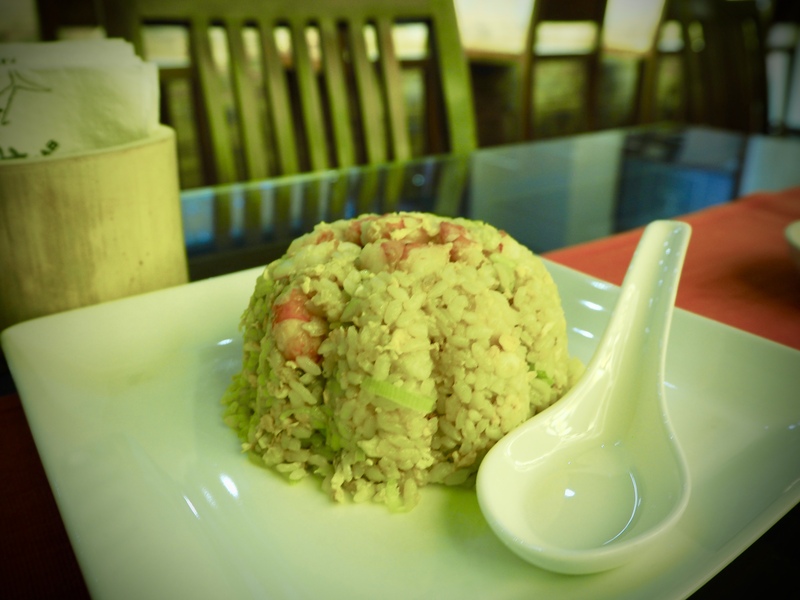 For our final savoury dish, we were brought a classic: fried rice. But this was a classic with a twist. 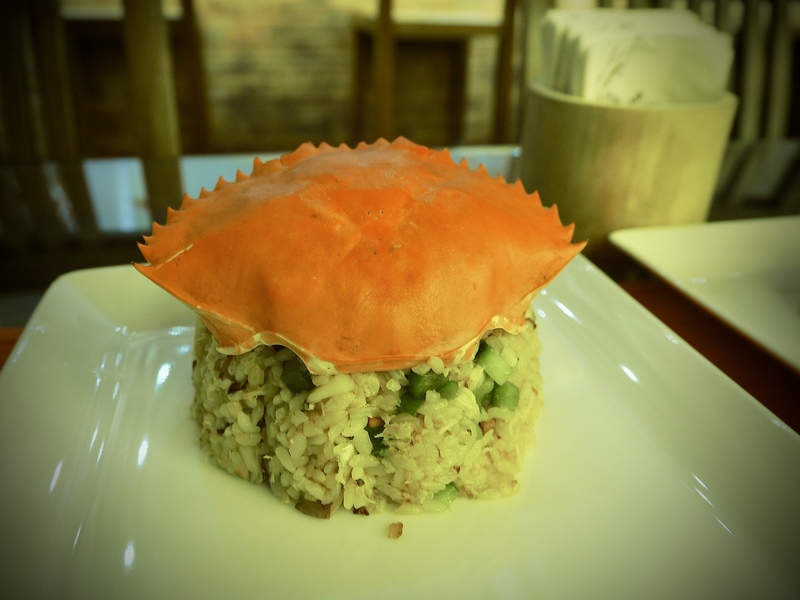 The crab version was bejewelled with generous helpings of crab meat and crispy charred caramelised onions – it was the best fried rice I’ve ever tasted, and perfectly combined sweetness with richness. The king prawn fried rice was also very tasty, but it paled in comparison to the crab version, despite the juicy prawns and fluffy rice. For dessert, The Tuna and The Crab served up a Japanese specialty: jelly. In this case, coffee jelly with condensed milk. I was not a fan, as the texture of jelly is a bit offputting for me, but my companion loved it and devoured every last bite. I, on the other hand, focused on the sencha tea, which definitely helped digest the vast amounts of food we had eaten! Overall, The Tuna and The Crab was a wonderful experience. Throughout the evening, the flow of the dishes was supremely well timed, and the service was, as we’d become accustomed to in Sri Lanka, very attentive and full of smiles. However, in comparison to Dharshan Munidasa’s other two establishments, Ministry of Crab and Nihonbashi, it doesn’t quite meet the same standards. The two dishes of sea bream sashimi and freshwater prawn absolutely blew me away, the fried rice and avocado crab were excellent, but the rest was simply… good. 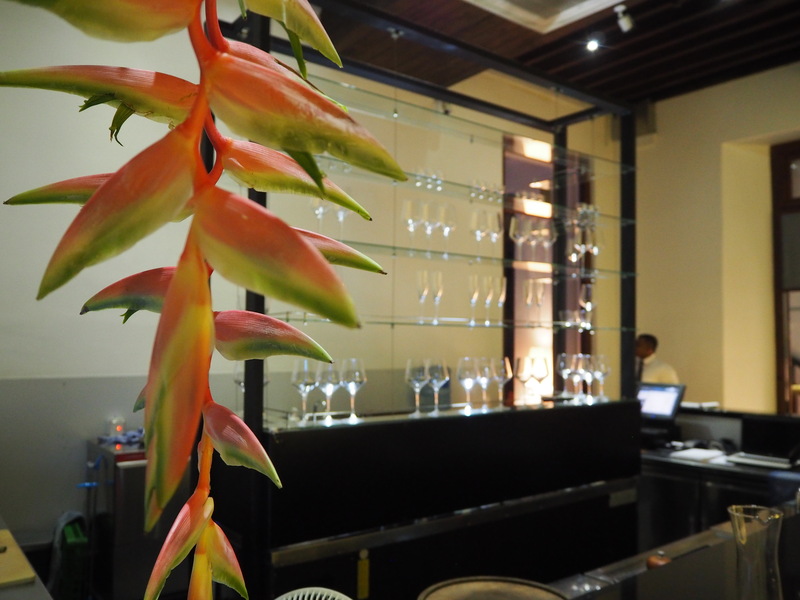 It’s definitely a welcome change from the standard rice and curry, and the atmosphere and service are elegant, tasteful, and relaxing after a long, hot day of walking around Galle. So if you’re in the area, I suggest you go for the freshwater prawn with a side of crab fried rice, bring your own bottle of wine, and relax amidst the light fixtures. You won’t regret it! I was a guest at The Tuna and The Crab, but as always, all opinions are firmly my own.